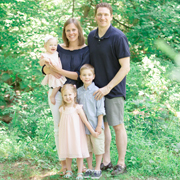 Allow me to introduce you to our cookbook collection. Well, a small part of our cookbook collection. This doesn’t include two more hidden shelves and a box in the garage. Not to mention stacks of Bon Appetit and Food & Wine. And, oh, yes, the dozens of food blogs that I subscribe to. And, yet, sometimes it feels most convenient to Google an ingredient or an idea and arrive at inspiration for dinner. But we’ve been making more of an effort recently to prepare dishes that we’ve bookmarked and dog-eared. This is one such recipe. It comes from Veganomicon: The Ultimate Vegan Cookbook that we purchased after we previewed Forks Over Knives earlier this year. 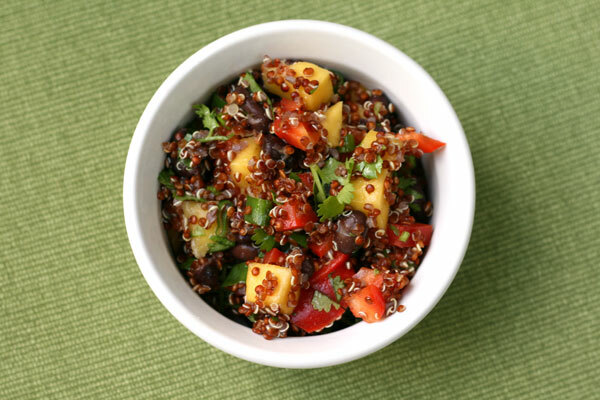 The simple side salad includes quinoa, mangoes, red bell peppers, scallions, black beans, and cilantro in a simple oil and vinegar dressing. 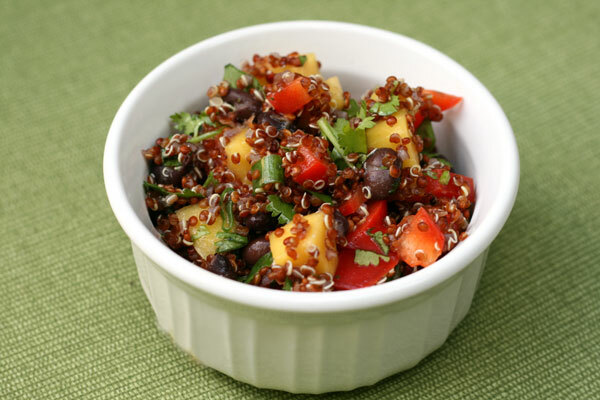 Though you can substitute any grains, beans, and fruits. And you certainly don’t have to be vegan to enjoy it. Combine mango, red bell pepper, scallions, and cilantro in a mixing bowl. Add red wine vinegar, grapeseed oil, and salt; stir to combine. Add quinoa and stir until incorporated. Fold in black beans. Serve chilled or at room temperature. Thank you so much for posting this. It looks amazing and I will make it very soon! 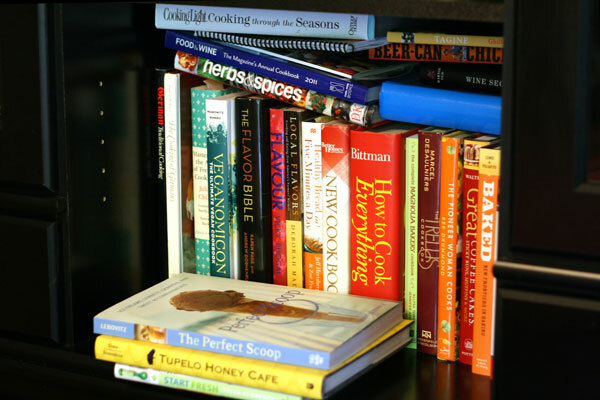 Isn’t it funny how much we rely on web resources when we have all these great cookbooks. It’s nice to change up the routine once in a while – this salad looks fresh and delicious! I am glad that somone’s collection is large than mine (by quite a bit, might I add!). This salad looks GREAT! Can’t wait to try it! I own a ton of cookbooks too and I’ve been making it a point to cook through all of them… it’s a personal goal of mine. Still, it’s so overwhelming and there are so many others I want to buy but I know I’ll be eve more overwhelmed. Do you have a strategy?